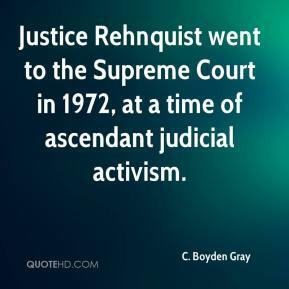 Justice Rehnquist went to the Supreme Court in 1972, at a time of ascendant judicial activism. 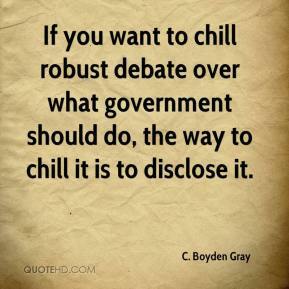 If you want to chill robust debate over what government should do, the way to chill it is to disclose it. His belief in the Founding Fathers' vision of judicial restraint, federalism, and deference to the legislative and executive branches ... has enjoyed a tremendous renaissance in his time. 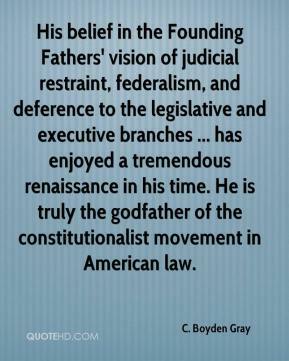 He is truly the godfather of the constitutionalist movement in American law. 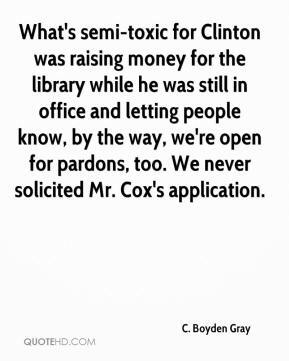 What's semi-toxic for Clinton was raising money for the library while he was still in office and letting people know, by the way, we're open for pardons, too. We never solicited Mr. Cox's application.